A material incorporating atomically thin layers of water is able to store and deliver energy more quickly than the same material without the water layers. This is the conclusion of research carried out at North Carolina State University (NC State), which is said to raise questions about the behaviour of liquids confined at this scale, and could inform future energy-storage technologies. “This is a proof of concept, but the idea of using water or other solvents to ‘tune’ the transport of ions in a layered material is very exciting,” said Veronica Augustyn, an assistant professor of materials science and engineering at NC State and corresponding author of a paper describing the work in Chemistry of Materials. “The fundamental idea is that this could allow an increased amount of energy to be stored per unit of volume, faster diffusion of ions through the material, and faster charge transfer. “Again, this is only a first step, but this line of investigation could ultimately lead to things like thinner batteries, faster storage for renewable-based power grids, or faster acceleration in electric vehicles,” Augustyn said. For this study, the researchers compared two materials: a crystalline tungsten oxide and a layered, crystalline tungsten oxide hydrate that consists of crystalline tungsten oxide layers separated by atomically thin layers of water. When charging the two materials for 10 minutes, the researchers found that the regular tungsten oxide stored more energy than the hydrate. But when the charging period was only 12 seconds, the hydrate stored more energy than the regular material. The researchers noted that the hydrate stored energy more efficiently – wasting less energy as heat. 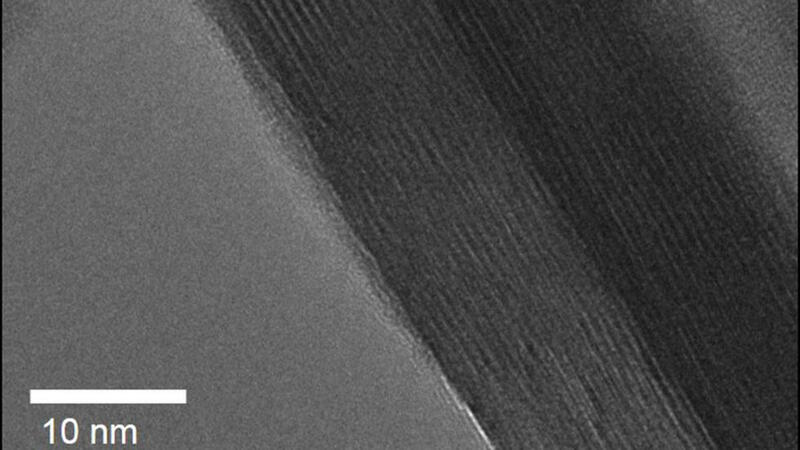 “Incorporating these solvent layers could be a new strategy for high-powered energy-storage devices that make use of layered materials,” Augustyn said. “We think the water layer acts as a pathway that facilitates the transfer of ions through the material.